Following Products are included in our combo offer of Agricultural Soil Test kit. 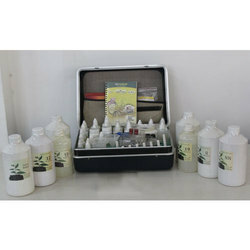 - Soil Testing Kit - 1pc. For quick estimation of pH, Nitrogen, Phosphorus & Potassium. - Portable pH Meter - 1 pc Range: 0-14 pH, Resolution: 0.01pH, Accuracy:0.01pH..
Advanced Technocracy Inc. is Manufacturer, Exporter & Supplier of Soil Testing Kit. With a focus on the ever-evolving demands of our customers, we are engaged in manufacturing and exporting a wide array of Soil Testing Kit. Soil Testing KitA very useful kit to determine on the spot soil pH value. This is a compact kit easy to carry on site. 12 thick walled test tubes with rubber bungs. A very useful kit to determined on the spot soil pH value. This is a compact kit easy to carry on site. Consists of: 12 thick walled test tubes with rubber bungs. 1 tube cleaning brush. 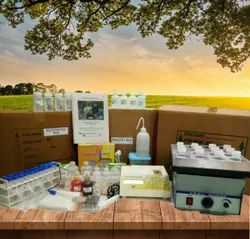 - 1st Lab-60 : Deluxe Water and Soil Analysis Kit 3 1/2 digit LCD display covering 7 parameters : pH, Conductivity, TDS, Salinity, Turbidity, D.O & Temp.with rechargebale battery complete with accessories, fitted in briefcase. Ph Paper Strips, with Dispencer Feature · 1~14 pH. · Erma, make. · Ph Paper strip with Dispencer. · 5 Meter Roll. · 45mm x 7mm (L x W). PH 1-14 color chart in each pack. The test strip color changes must be matched with the pH scale color chart within about 15 seconds.